London is perhaps too wedded to its past. 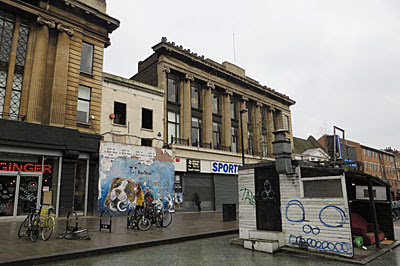 Take Spiegelhalter's, for example, a tumbledown ex-jewellers shop on the Mile End Road. This stands in the way of a major redevelopment which could provide much needed office space in one of London's poorest boroughs. And yet campaigners are now demanding the retention of its derelict skeleton because of some alleged heritage value. Priorities, much? Things could have been so different. When Wickham's department store looked to establish itself in Stepney in 1927, their ambitions were thwarted by the obstinate presence of a small jewellers shop in their midst. 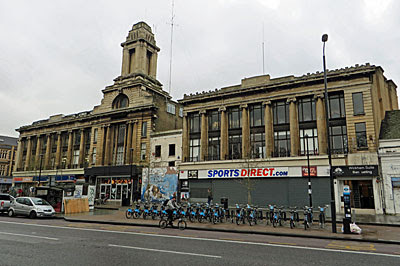 Wickham's had started out as a drapers at 69-73 Mile End Road, and had gradually bought up all the adjacent properties except for Spiegelhalter's at number 81. This Jewish family stubbornly refused to relinquish their shop, even for a floorful of sovereigns, and so Wickham's eventually went ahead and built their new edifice around them. Their grand classical facade was thus constructed with an embarrassing gap, the ionic columns broken in midair, and the great square tower positioned awkwardly asymmetrically. Wickham's could have been the Harrods of the East End, but instead it must have been a laughing stock. Wickham's department store closed in the 1960s, outlived by the renegade jewellers and clockmakers lodged in their midst. Since then the building has limped on as a series of retail units, with a conference centre now in place on the upper floors. The peculiar structure of the building means that there are two separate banqueting suites, apparently ideal for segregated Islamic weddings, but hardly living up to the site's optimum potential. The ground floor now consists of an unnecessary Tesco Express, an independent coffee shop and a branch of Sports Direct (replacing a doomed Blockbuster Video). And, of course, that gaping hole in the middle. Where Spiegelhalter's used to stand is a magnolia wall with glassless windows and an empty shell behind. The boarded-up frontage bears evidence of flyposting and a leftover Christmas campaign for the Dogs Trust, hardly the sign of a thriving community. And out front is the wreck of a 24 hour snack bar, quietly decaying on the pavement as planning permission for its replacement is sought. Is this the face of London we should be showing to potential international investors? Thank goodness a brave developer has come forward with plans to knock most of the building down and replace it with something more profitable. The new project is called Department W, and has been put forward by Resolution Property, a leading European real estate investment fund. They see the Whitechapel property as a key part of their emerging portfolio, and hope very much that their mixed use development will bring a high financial return. "The proposals seek to refurbish Dept W into modern TMT office space, with a sensitive new 15,000 sq ft extension to the top of the building. The proposals look to turn the now empty space of the holdout unit into the new, vibrant heart of the redevelopment as homage to the Spiegelhalter story. Sculptural shards will be introduced to create a bold, new public entrance on Mile End Road." 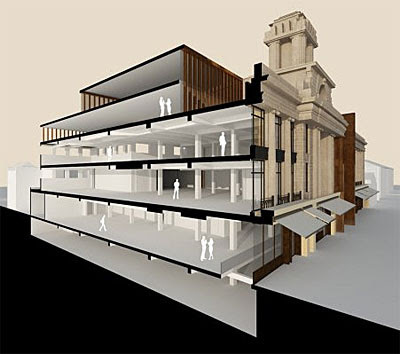 Their proposed redevelopment follows a familiar model where the facade of an old building is retained, to keep the heritage nimbies happy, but everything behind is demolished. The end result often looks jarring, in this case a glass atrium behind a two-dimensional stone wall, but greatly increases the amount of office and leisure space that can be constructed behind. And niggly little Spiegelhalter's survives only as a gap, the lobby through which office workers and leisure users will enter, a century-long standoff finally brought to and end as Mammon takes victory. So why not go further? This building's not protected, it's not even on Tower Hamlets' local list, so why not demolish Wickham's entirely. Retaining the old frontage merely holds the developers back, when what we could enjoy instead is an unfettered cuboid of steel and glass with maximum rental opportunity. Indeed there are several old buildings across the East End that no longer perform any important economic function and could all be entirely replaced by something characterlessly functional. In our post-austerity world, only an emotional curmudgeon could possibly argue otherwise. Wickham's is a failed monument to capitalism, a victory for the little man, and as such not a educational model we should preserve. And Spiegelhalter's old shop isn't a classic architectural joke, it's the embodiment of a thorn in the side of progress, and won't be missed. So please don't listen to the head-in-the-sand do-gooders who'd like to see this 20th century wreck preserved. And whatever you do don't sign their ridiculous petition, because London's inevitable future is as a forest of highrise glass boxes with retail units underneath. The past must always be a casualty in our capital's drive to economic success.